Get maximum performance and reliability. Boasts terminal performance with the accuracy and retained energy of a ballistic tip. Nosler Partition. 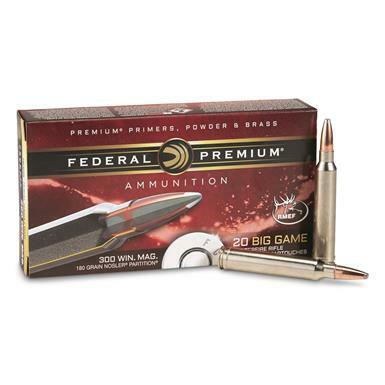 Federal Vital-Shok, .300 Winchester Magnum, NP, 180 Grain, 20 Rounds is rated 5.0 out of 5 by 10. Rated 5 out of 5 by Mark49 from A DEMOLITION WORK! It was in Spain (Europe) last season 2017/2018, first time i tried "montería española". Big europeans deers and wild boars being chased by many packs of specialized hunting big game dogs around a thickness and abrupt mountain skirt running swiftly. You had to shoot in movement and very quick and no longer than 100-120 yds to bring down the animals. The most difficult situation was to stop the animals in a narrow firewall mountain path 10-12 yds length avoiding them go to die toward depth of the forest. The Nosler Partition 300WM 180 gr done the work FANTASTIC, 2 big male deers (400-450 lbs) and one medium wild boar (150-160 lbs) were stop and died in their own footprints crossing the path like laser-rays!!!!! Best cartridges for this kind of big game hunting i have ever used. Rated 5 out of 5 by Just say shoot from Great round! The Federal Premium NP is my favorite round in several calibers with the 300 Win mag 180 grain being my “go to” for elk. The results at the range are almost always sub-Moa and have been devastating in the field....for the elk! My selective range is out to 300 yards and this load has performed flawlessly over the last 29 years. No reason to change now! Rated 5 out of 5 by LD375 from Great Ammunition! This load shoots .5" groups at the range out of my Tikka T3 Hunter, on game performance is devastating, I used this load on a mature black bear in northern Ontario, it made a huge entry and exit hole dropping him pretty much where he stood!..This bullet and load is the real deal, I'll use nothing else up to and including Grizzly. Rated 5 out of 5 by Abswat from Winner What can you say? Combine Federal Premium with Nosler Partition and you've got a winner that's been proven time after time. Sportsman's Guide always has the best ammo prices. Rated 5 out of 5 by Jagter from Excellent Hunting Round This is one of the best bullets and caliber combinations made for hunting. You just can't beat a nosler partions bullets performance on game of all sizes. This particular round gets excellent less than 1 inch grouping at 200 yards. I have used this on game all over the world and it has never once failed me. Happy Hunting! Rated 5 out of 5 by MIKE from I have used these shells on deer, hogs, Waterbuck, Kudu,Gemsbok and more. This is my go to ammunition.